In 1891 the new B. C. Land and Investment Agency Building rose on this block. Among the tenants was Charles Rogers with his candy manufacturing business. The B. C. Land and Investment Agency was founded by London publisher Thomas Dixon Galpin who bought several parcels of land in Victoria, then bought out Alsop and Mason, realtors. The company was Victoria’s principal marketer of land during the 1900-1914 boom. At one time it owned or controlled half of the land in the Victoria area. The new building joined smaller ones in this block. 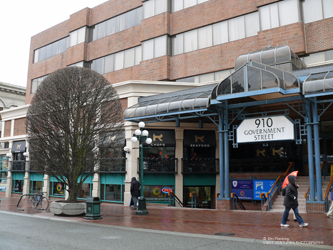 In 1907, when the streetcar travelled by, the businesses on this side of Government Street included the B. C. Land and Investment Company, Peden Bros. – bicycles, Bodwell and Lawson – barristers, George Hargreaves – civil engineer, Drury and MacGum – real estate, C. W. Rogers – confectionery, George A. Fraser – druggist, B. C. Fur Manufacturing Co. Ltd., and R. Porter and Sons – butchers. Amid great controversy in September 1974, the entire city block was demolished and replaced by the Harbour Centre Shopping Mall. Copyright © 2019 Hallmark Heritage Society.All rights reserved.